EAST CHICAGO — Most wrestlers were happy just to make it out of Saturday’s East Chicago Semi-State. Not Wawasee wrestlers Braxton Alexander and Geremia Brooks, however. After cruising through the ticket round in East Chicago, the top five-ranked cousins were on a mission to show they were the best in the field. Mission accomplished. Alexander and Brooks collected championships at 138 and 132 pounds, respectively, while Braxton’s younger brother Jace earned himself a third-place result at 120 pounds as Wawasee qualified three for next weekend’s state finals in Indianapolis. “We came in with the mentality of not just making it to state but the mentality of winning. Achieving that goal was a big step, so it’s a pretty great feeling,” said Brooks. 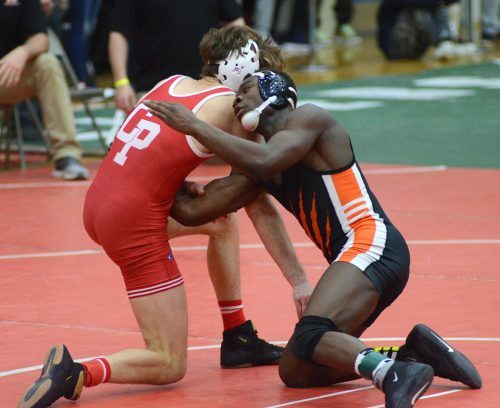 Brooks in fact put up a grand total of 74 points throughout Saturday’s semi-state tilt, tech falling his first two opponents by margins of 22-7 and 20-3, then earning a 20-6 major decision over Portage’s Ricky Hegedus in the semifinal round. The senior 32-pounder survived an early slam by Hammond Morton’s Reese Rodriguez in the finals, then turned it on en route to a 12-6 decision and the championship. Braxton got the job done a little differently at 138 pounds, out-pointing two of his opponents but sticking two others on the way to the title. Braxton Alexander finishes West Lafayette’s A.J. Poindexter in the first period of their 138-pound title bout in East Chicago. He got off to a bit of a slow start with a 5-0 decision in the opening round, then qualified for state with a 3:35 pinfall of Portage’s Tyler Herring. That alone was redemption for Braxton, who took a nasty spill on his head and was injury-timed out of last year’s ticket round opposite another Portage wrestler, Colin Poynter. Braxton rolled after Saturday’s quarterfinal, tech falling Lafayette Jeff’s Cameron Worley to make the finals, then pinning West Lafayette’s A.J. Poindexter in the first period of their title bout. “There was a mental block in my ticket round. It was on the same mat, same area, same school that I was wrestling. After my match, I just felt really good to get past that, and I felt like some weight was lifted off my shoulders,” explained Braxton. While Braxton earned himself a trip back to state after his first go-round in 2017, younger brother Jace earned his second straight state berth Saturday. 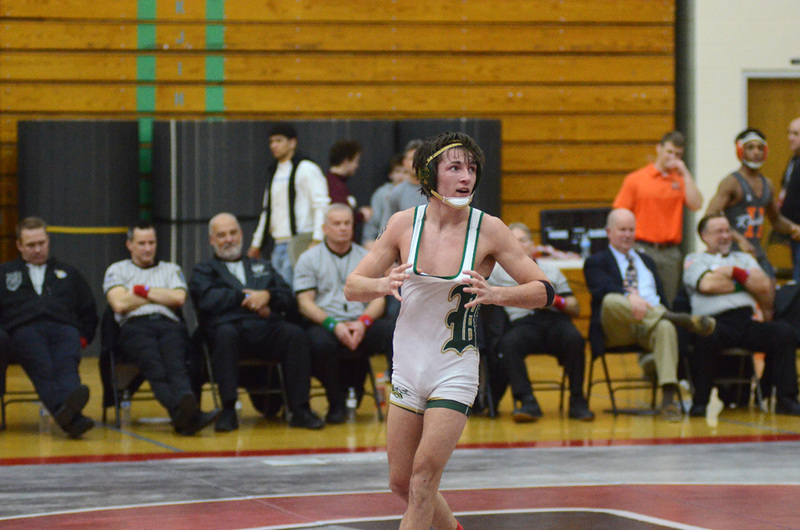 After bumping up from 106 as a freshman to 120 pounds this year, the Wawasee sophomore needed an adjustment period to get used to his new weight but has come on strong at the right time. On Saturday he punched his ticket to state via 6-2 decision over McCutcheon’s Tyler Brubaker in the quarterfinals before losing a major decision to eventual East Chicago champ Riley Bettich of Crown Point, then bouncing back with an early second-period reversal of Portage’s Ty Haskins in the consolation final, sticking him on his back at the 2:05 mark. Jace Alexander looks to the Wawasee crowd after earning his second straight state berth in Saturday’s 120-pound quarterfinals. 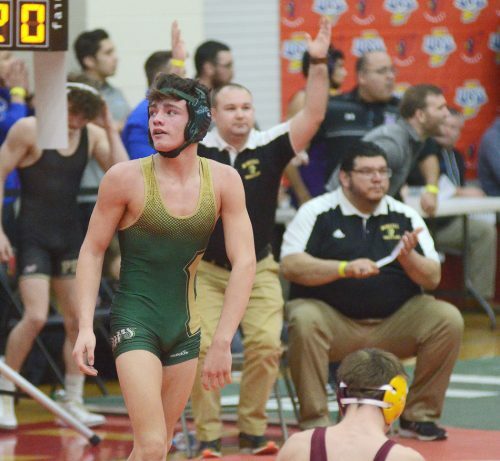 In total, Wawasee brought nine wrestlers to Saturday’s semi-state tournament, but only the Alexanders and Brooks advanced to the final round of the state series next Friday and Saturday at Bankers Life Fieldhouse. Damien Rodriguez and Isiah Faurote both lost their openers at 195 and 152, respectively, while Dylan Tom (106), Garrett Stuckman (145), Alex Castro (182) and Hagaen Slusher (285) all made it to the tourney’s ticket round before coming up a little short. Castro’s quarterfinal loss was an especially bitter pill as he led LaPorte’s Noah Perez by a 3-1 margin in the final period before a scramble left him on his back and gave Perez the pinfall with just 35 seconds remaining in the match. 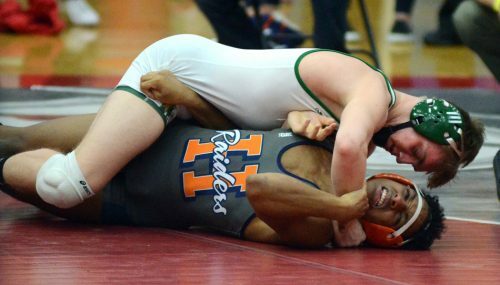 Also at East Chicago, a trio of Warsaw wrestlers closed out their seasons Saturday. Warsaw’s Jacob Bass takes the back of Jake Burford of Crown Point in the 145-pound quarters. Brandon Estepp lost his 160-pound opener with Lowell’s Abel Verbeek, while Jacob Bass and Jose Grimmett both lost in the quarterfinals. Grimmet was pinned by Chesterton 52-pounder Brock Ellis midway through the second period, while Bass hung tough with tournament 1 seed Jake Burford of Crown Point but succumbed via 13-4 major decision. 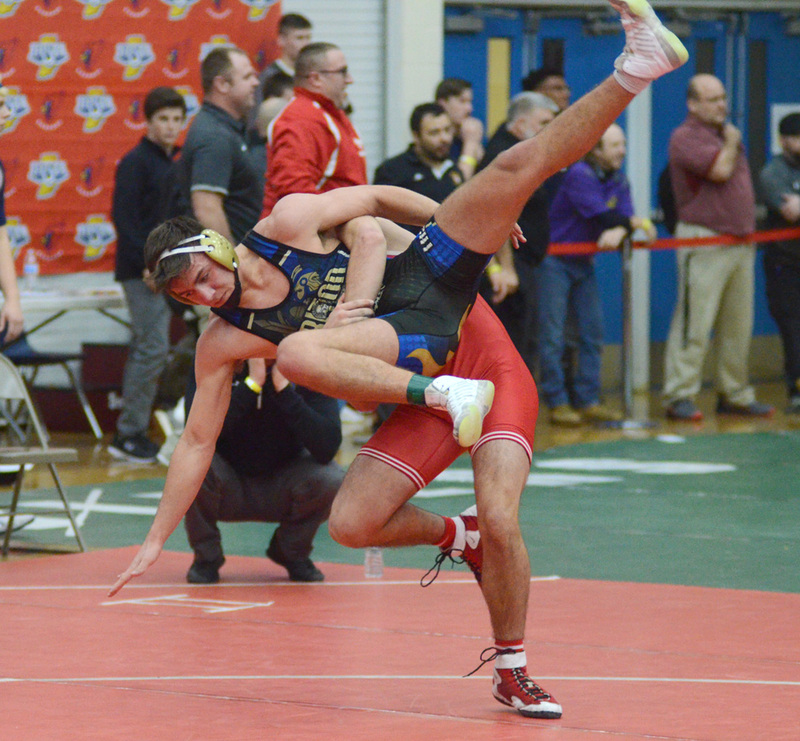 For Tippecanoe Valley, Drake Montelongo lost on a last-second pinfall to Lake Station’s Andres Russi in their 113-pound opening match, while Branson McBrier — a late injury replacement — lost by tech fall to McCutcheon’s Evan Burge in the first round at 126. Triton’s James Snyder won his 95-pound opener via forfeit but suffered a 5-2 decision loss to Crown Point’s Ethan Potosky in the quarterfinals, meanwhile. While three Wawasee wrestlers survived at East Chicago, NorthWood’s Jake Lone punched his ticket to the state finals a second straight year with a runner-up finish at the New Haven Semi-State Saturday. Lone collected an 18-3 tech fall over Fort Wayne Snider’s Vertis Hawkins in his opener at 182 pounds, earned a narrow 5-2 decision over Mississinewa’s Kyler Funk in the quarterfinals and shut out Garrett’s Austin Leech via 13-0 major decision to make the championship opposite Jay County’s Mason Winner. Lone lost a 3-2 heartbreaker to Winner in the final but survives to wrestle another day. Lone’s teammates Tyler Becker and Jaden Miller both lost their openers by pinfall at 160 and 170 pounds, respectively, to close out the year. Triton’s James Snyder is slammed by Crown Point’s Ethan Potosky in the 195-pound ticket round.